The Forty Fort Meeting House, built in 1806-8, and located in the Old Forty Fort Cemetery, is a wood-frame building with white clapboard siding in a style typical of New England meeting houses. The style was carried to the Wyoming Valley via the Connecticut settlers who migrated to northeastern Pennsylvania in the late 18th century. In 1768, the Susquehanna Company set aside certain public lands to be used for a "gospel ministrie" (Susquehanna Company Papers, Vol. III, p.44). Several factors intervened to delay actual building of a house of worship, including the first and second Yankee-Pennamite wars and the American Revolution, especially the Battle of Wyoming (July 3, 1778), when a house of worship that was begun was destroyed in the aftermath of the battle. Construction of the Meeting House began soon after the resolution of a 30-year long conflict between Pennsylvania and Connecticut claimants for title to the land. The commission to design and build the Meeting House was given to Joseph Hitchcock from New Haven, Connecticut. Hitchcock was also the designer of the Old Ship Zion Church in Wilkes-Barre-an entirely different style of architecture. The Meeting House was the first finished church in which religious services were held in this part of Pennsylvania, and was used for services by both Presbyterians and Methodists. The Forty Fort Meeting House is the only extant example of the New England influenced style of architecture in the immediate area that is not greatly altered from its original appearance. In March 1860, the state legislature approved a bill creating the Forty Fort Cemetery Association, which still retains control of the cemetery and the Meeting House. 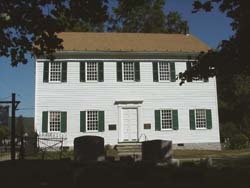 The Forty Fort Meeting House is located in the Old Forty Fort Cemetery on the northern end of River St., across from the Forty Fort Borough Building, in Forty Fort. It is open to the public on Sundays 1 PM – 3 PM from Memorial Day to the last Sunday in September as well as Memorial Day and the 4th of July. It is also open on Labor Day from 1 PM – 3PM. In September there is a Sunday lecture series focused on historical topics of the Wyoming Valley which are free and open to the public. An ecumenical Vesper Service closes the season on the last Sunday of September.